Mappe-monde suivant la projection de Mercator. This rare hand-colored map is a copper-plate lithographic engraving, dating to 1832 by the respected German cartographer Conrad Malte-Brun. . It is a representation of the world on a Mercator projection. Map is hand colored in outline form. All text is in French. 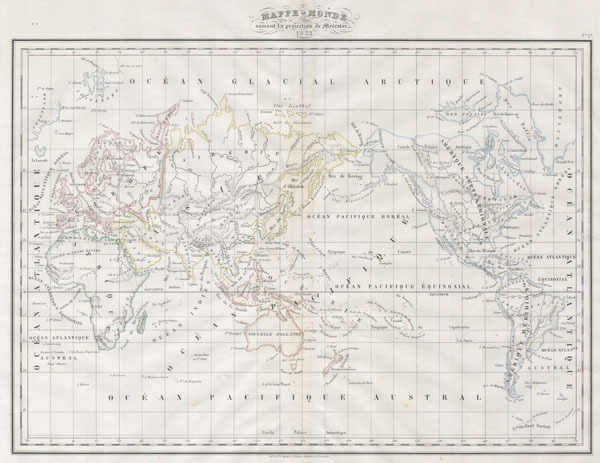 This map is based upon Malte-Brun's early 19th century cartographic studies and were published in Paris as the 'Geographie Universal.' This particular edition was revised and updated by French engraver J. J. N. Huot to the standards of 1832. The work of Malte-Brun was long known for its minimalist simplicity.